Sharpe Engineering, managed by our QMS (Quality Management System) is systems driven and procedure focused. Our QMS is third party certified to the oil and gas industry’s highest level of quality accreditation worldwide, API Spec-Q1 (9th Edition) and ISO 9001:2008. Sharpe believes that it is strategically imperative to implement and maintain a QMS. Our QMS provides a framework to ensure continued success and improvement of Sharpe in the years ahead. Sharpe’s QMS, signed off and managed by our CEO, details all operational policies, procedures and operational requirements related to the day to day running of the business. Our QMS is designed to demonstrate the ability to provide consistent products and services that meet customer requirements and conform to API Spec Q1 9th edition technical Specifications API Spec 7-1 and API Spec 5-CT. The quality system manual also addresses customer satisfaction through the effective application of the quality system, including processes for continual improvement and the prevention of nonconformity. Sharpe’s QA managers deploy a mandatory processes that reviews, evaluates, plans and continually improves our operations thus ensuring that all team members operate with integrity and in accordance with the QMS to create a sustainable future. Sharpe Engineering is an audited and certified vendor on the Achilles FPS (First Point Supply base) online portal. 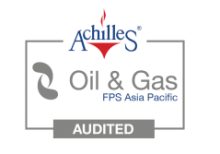 The Achilles FPS system is a generic prequalification portal used for Oil & Gas buyers in the Asia Pacific region. All workshop manufacture, repair and servicing works are undertaken with an approved documented “traveller” job file. Each job is assigned a designated serial number detailing full material traceability and inspection. Material data from the mill, heat certs, testing reports etc. With our quality certificates in place – all projects and staff at Sharpe are systems driven and procedure focused. Sharpe have invested heavily in a suitable ERP system and adopted an all-encompassing system in 2008. The ERP manage enquiries, purchasing, call management, production, accounts, invoicing, payroll and has a scheduling feature to automatically schedule and track customer jobs in real time. Recording of this data enables us to monitor and improve on our “delivered in full on time” track record. Sharpe’s ERP system is continually monitored by our QA Manager as part of our QMS (Quality Management System). Sharpe’s management and business development team utilise a purpose built CRM (Customer Relationship Management) package and have a client focused App allowing clients to submit requests for quotations via their smartphones. All Sharpe and third party proprietary gauges are stored in a temperature-controlled room. Gauges are managed, calibrated and inspected by our Quality Inspectors or Materials Managers only. As some gauges are licensed property of patented threads and hold confidential IP (Intellectual Property) the lab is secure at all times. We hold a growing list of premium license connections for drill pipe and casing.